September « 2009 « everyday. periphery. Much better spelling support in Snow Leopard. When I wrote an e-mail in Norwegian today, I again had to realize how bad I am with my spelling. 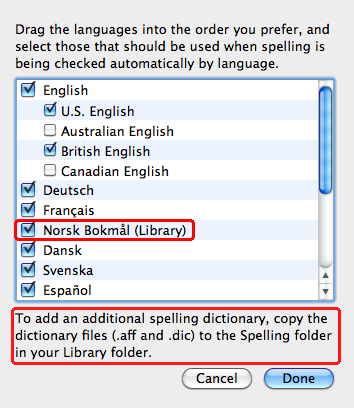 Since I just installed Apple’s new operating system Snow Leopard I went to check if it happens to support Norwegian spelling correction. It did not. But when I checked out the new spelling options in the Text tab of System Prefences’ Language & Text panel, I saw the picture that you can see here too. This means that OS X 10.6 supports spelling dictionaries such as those used by OpenOffice. Yay! That means that we now have a ton of other spelling options without having to resort to services like CocoASpell, which never really worked too well for me. So now getting support for other languages is as easy as visiting an OpenOffice dictionary server to download the dictionary you need, unzipping the dictionary and dropping the .dic and the .aff file into the Spelling folder inside the Library folder. (Either in your home directory, or, if you want to install the dictionary for all users of your machine, into the root level Library’s Spelling folder.) The great thing is that we now have full spelling support for many, many languages in all applications that support Apple’s spelling services, e.g. in TextEdit, Pages, Nisus, Mellel,… What a wonderful day!